ARRRR! European pirates gathering in scrap yard next to very busy and noisy railroad, that’s European Pirate Summit. It’a an event one of it’s kind. Over 600 stARRRtup pirates from Europe and beyond have gathered in Cologne to walk the plank but stay on board, share treasures, get rum-inspired, fire-tested MVPs, exchange startup pray and train crew. 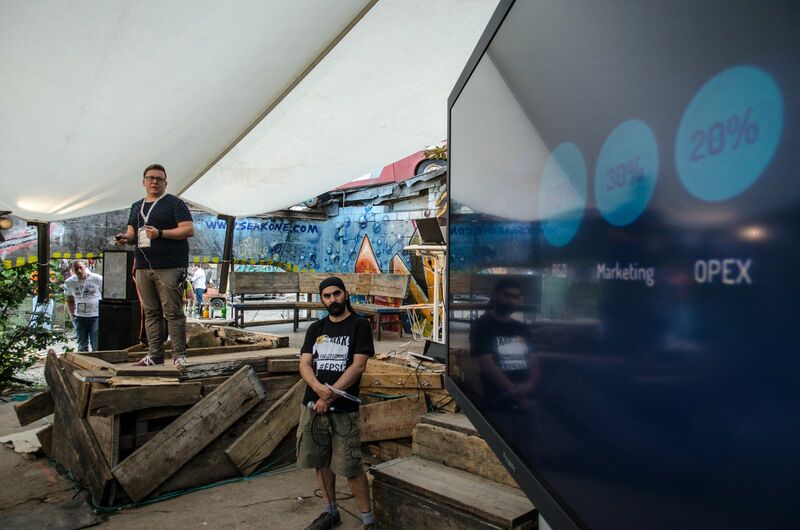 Very exciting Imagga was part of European Pirate Summit 2013 together with really big Bulgarian delegation – Stefan from LAUNCHub, Boyan from StorPool, Ivo from UAN, Simeon from SocialNet365, Milen Ivanov from Sponsia, and couple of Bulgarians that study and work in Cologne. Post by The European Pirate Summit. Getting to the Western part of Europe from Sofia looks like it’s not easy. For second time our flight was delayed (come on WizzAir you can do better then trowing a croissant and bottle of water for 4 hour wait), the previous time was for Photo Hack day with BulgariaAir in June. Besides the travel trouble, Cologne and the event was awesome. And I mean it! The startup community in that part of Germany is not as big as in Berlin, but still very vibrant. We were invited to pre-event dinner in White Rabbits Mansion – co-working, co-living, co-partying space with awesome vibe and even more awesome inhabitants. Monday started with participation in pitching workshop in one of Cologne co-working space – Clusterhaus. Great feedback for Imagga presentation, but may be too much slides. 3 min pitch is not easy to do, specially when it’s not just product pitch but you need to say a bit about the company, competition, business model, next steps, current customers, etc. The speakers lineup during the first day was extremely exciting – Evan Nisselson on Ups and Downs of Entrepreneurship, Gabriel Hubert on Pivoting like a boss, Rob Fitzpatrick on Lean Startup in Practice to mention some. Oh, the party, but I am not supposed to write about this, right! You know, mainly networking, biz cards exchange… A, and a bonfire, the pirate style. Day two was marked with the excitement of Walking the plank – 9 startups where town to the VC sharks! Some of the talks that I visited and really enjoyed – Shira Abel on Starrrtup Marketing for Pirates, Andreas Klinger on Startup Metrics for Pirates, Devin Hunt on Advanced Business Model Design and the closing keynote of Rob Fitzpatrick. Pitching time, the adrenaline was speeding up my pulse, and walking on the stage felt really good. Imagga’s presentation went really good, just on time and with interesting questions from the jury. Even though Imagga was not one of the three finalists of the pitching, we got really positive feedback and genuine interest in what we do from both VCs and prospective users of our services. Thanks Cologne and Pirate Summit team for making this even happen. We will be coming back!